Morocco, which launched on Wednesday its second high resolution earth observation satellite dubbed “Mohammed VI-B”, has two coastlines, stretching from the Atlantic Ocean on the west to the Mediterranean Sea on the North. The Atlantic coast of the North African Kingdom stretches over 3500 km. It is one of the richest coastal areas in marine resources and the deployment of the new satellite completes the country’s two-satellite constellation for earth observation. The country plans to use the satellites for land mapping, natural-disaster prevention and management, environmental monitoring, border surveillance and survey of the coastal strip which is experiencing a strong demographic and industrial pressure on a fragile ecosystem. Satellite observation is very useful for a better integrated management of oceanographic areas, marine and littoral environment and coastal zones as well as in marine pollution prevention. Satellite images are important tools for the valorisation of fish resources, the selection and management of aquaculture sites. Remote sensing data will also help decision-makers adopt the best choices in the hydraulic resources management as water plays a key role in food security, ecosystems balance and biodiversity. 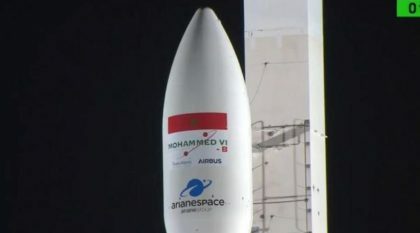 The Mohammed VI-B satellite was developed by a consortium comprising Thales Alenia Space and Airbus. It joined on Wednesday its twin, MOHAMMED VI – A satellite, which was orbited by Arianespace on November 7, 2017. The two satellites are part of an ambitious space program launched by King Mohammed in 2013. They are complementary and will be managed by Moroccan engineers and other technical personnel trained for this purpose. These civilian satellites will be used for land surveying, regional development, agricultural monitoring, the prevention and management of natural disasters, monitoring changes in the environment and desertification, and border and coastal control.